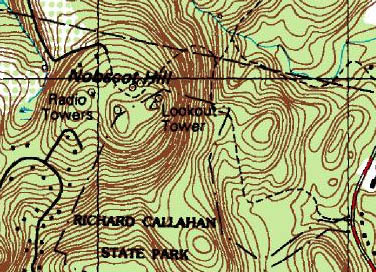 Located near Framingham, MA, Nobscot Hill is perhaps best known for its fire tower and boy scout reservation. According to NELSAP, The Nobscot Scout Reservation cleared a ski slope circa 1963 and planned to install a rope tow. There is no evidence that lift-served skiing ever ended up happening, however. A portion of the planned ski slope is still apparently visible.